The SATELLITE Conference Program has been announced! Choose the sessions you want to attend during SATELLITE week and be sure to register by December 8th for early bird discounts! Our annual Satellite Manufacturing Executives Panel – historically, one of the most popular sessions at the SATELLITE conference - is getting a promotion! 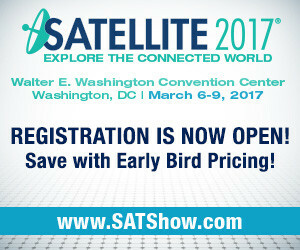 At SATELLITE 2017, the Manufacturers Panel will be our Wednesday Morning Opening General Session on Wednesday, March 8 at 8:30 a.m. and will be free to attend for all conference and exhibit hall registrants. We are pleased to announce the return of NSR Senior Analyst Carolyn Belle as the session moderator and thrilled that SSL President John Celli and Boeing Satellite Systems International President Mark Spiwak have already confirmed that they will join the panel as speakers. The SATELLITE 2017 exhibit hall is filling up quickly! With more than 92% of space already reserved and a handful of prime locations still available, we urge you to reserve your booth now to position your company favorably at the largest global gathering of more than 14, 000 high-level professionals from every facet of the satellite-enabled communications marketplace. Check out the current exhibit hall floor plan and list of exhibitors and don’t miss your best opportunity of the year to connect with and make an impression on thousands of your customers, business prospects and potential strategic partners! To reserve your exhibit space, contact Michael Cassinelli today at MCassinelli@accessintel.com or +1 (301) 354-1691. Already found the perfect booth location for your company? Download the exhibit space contract to reserve your space today! Did You Know? Exhibitors now have the opportunity to conduct technology demonstrations and presentations in the all-new SATELLITE Unveiled Theater located on the show floor. Demos and presentations are built directly into the conference schedule and are promoted throughout the year – and onsite – as part of the official conference content. Presentation slots are now available on the afternoon of Wednesday, March 8 – contact Michael Cassinelli at MCassinelli@accessintel.com or call +1 (301) 354-1691 for more information. Join your fellow colleagues as the WTA celebrates companies and individuals who have dramatically demonstrated excellence in the field of teleport operations, development and technology. Tickets can be purchased during the registration process.